I love my kids. I do. But, really, what is it with the moment that you sit down, get yourself comfortable, that they insist they are starving and need a snack? Can someone please explain this to me? No, never mind…don’t. That was me just before Christmas, I had slid my shoes off and sat down with a blanket over my lap when my three-year old came up begging for a snack. I knew he was probably hungry but I was ready to rest for a while. I weighed my options and realized I wasn’t going to rest much if I didn’t get him a snack. So, I jumped up to run downstairs to get substance for my first-world starving preschooler! I took two steps down my hardwood stairs in my sock feet and that was it. The rest was on my back and rear. 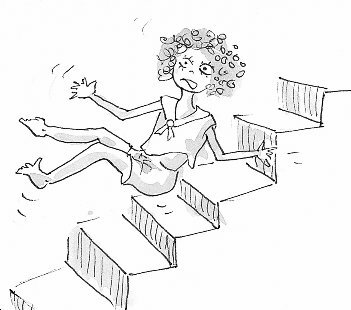 I couldn’t seem to stop, I just kept sliding, pummeling down the stairs. I made it just short of the bottom of the stairs and I immediately wanted to cry. It hurt so bad. No one saw me so it wasn’t my pride that hurt, it was my bum! It hurt and it still hurt three weeks later. Every time I bent over to pick something up or sit on a hard surface, I cringed. It really hurt. But, I looked fine. No one could tell I was hurting. I didn’t have a cast or crutches or even a bandage. There was no evidence that I hurt until an older gentleman at church dropped something right in front of me. Great! What was I supposed to do, not pick it up? I smiled and hid the tears welling up in my eyes as I bent over and picked up his paper. Ouch! When I asked the question on social media, What’s the hardest thing you’ve ever done?, I was humbled by your responses. And that day as I stooped to pick up a loose paper, I was reminded of those that have fought depression, drug abuse, losing a child, a parent or a spouse. I thought of the adult children still scarred by neglect, the hearts aching–all pain not easily visible. They walk right in front of me through the halls of the church, the aisles of the store and the stands of the ballgame. They look fine. No one can see their pain. There is no outward evidence of the hurt until someone asks the right question or something triggers a reminder of their pain. As believers, we are called to be comforters. For many it’s easy when we see the obvious hurt. A friend is diagnosed with cancer, so we take a meal. A colleague loses a loved one, so we offer our condolences. An elderly person walks with a cane, so we volunteer our assistance. But, how do we recognize the hidden pain? My pastor has a saying, “Hurting people hurt people.” If someone is sharp with their words, unkind in their actions, or downright mean, you’ve likely met a hurting person. It may not be obvious at first, but the pain is no less real. How can you tell what’s really going on? Take off your lenses and put on God-lenses. See their pain through God’s eyes and volunteer your love and comfort–not because it’s easy but because your love and comfort offers God’s love and comfort. You become God with skin on. When you find yourself defensive or hurt by the actions of others, stop and change out your lenses to see hidden pain. Question: In what ways have you been shown comfort and love when you were hurting? How have you shown it to others?